In the Kingmaker Campaign I'm currently involved in we're just about to start Book 5. When my GM heard I had resurrected the mapping project, he wanted to know how close I was to being done because he wanted to use my maps in the campaign. It's saved as a MASSIVE illustrator file so that I can add / remove / hide layers. Indeed, the file is so large, I can only save it as a bmp file which itself is about 20MB. I made this jpg from the bmp. I don't have a slow compiuter ;) If someone knows a way to make illustrator layers more open-sourced (i.e. work in the GIMP or something like that, please send me an email. 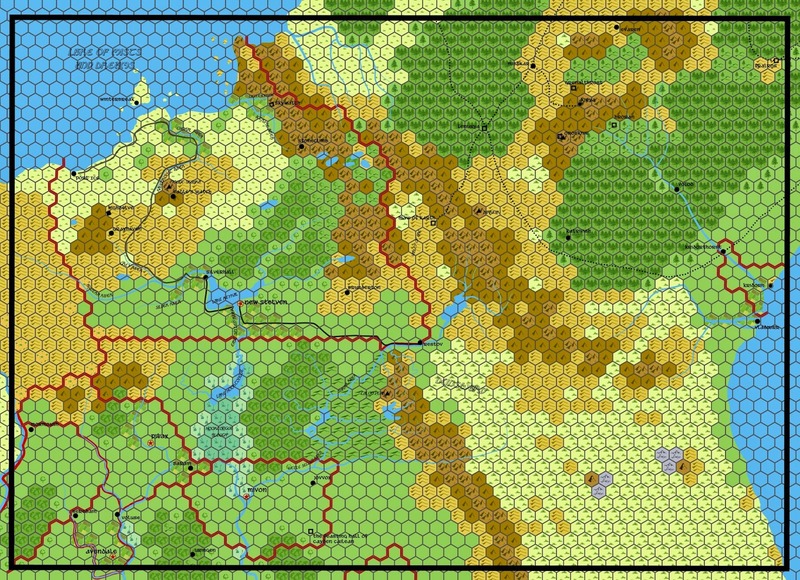 The beta version of my Kingmaker map. Inspired by several Paizo maps and descriptions. A little bit about the map. The city font is "Ale and Wenches" while the landmark font is "Bryn Athyn Condensed italic". The scale is 12 miles across (side to side) a hex - just like in Kingmaker. I don't have all the landmarks labeled and there needs to be a legend. Farms. They don't say where farms are exactly in the game, but they give general indications and I extrapolated from them. Pitax's farms are sometimes vineyards (its really more of a "cultivated land" hex). Mivon isn't a big farming nation - it makes its living off of the eels, whereas Touvette is all about farming. It would not take much arm twisting to get me to add farms there. And a reminder about the Slough, and swamps to a greater extent. The darker swamp symbols are deep enough to be navigable by flat bottomed boat at least. The lighter ones, not so much - though a DC 15 or 20 Profession: Sailing might get you through (check with your GM). Although the River Kingdoms maps don't have any additional swamps listed on them, the text frequently mentions that swamps aren't infrequent. The geography and paleo-history of the area argues for it as well. So I've included a few. That's all I have now. you should be able to biggify this map above by clicking. Enjoy! Thank you so much for this! Very well done John T! What are the purple hexes near the mountains in the Dunsward? You mean the ones adjacent to the volcanoes? Those are "broken lands" or "badlands". In this case they are specifically lava fields. Can you save it as a SVG? SVG is an open source format and programs like Inkscape can work with it. Hey John, I'm currently using your map in a DND campaign that i'm running. Would you mind sharing this amazing creation of yours in it's original illustrator format with all of the layers? We should share it through google drive or dropbox or something? It's not really possible as I've made extensive changes to the map since then. What's here is an artifact of the time it was created.